Radio Frequency transformers describe those used at frequencies including RF VHF and UHF. At each of these frequencies, construction varies considerably. RF is considered to be the lowest band of frequencies in this group, and transformers working at frequencies between 30kHz to 30MHz may often have their windings "tuned" to a particular frequency by the addition of a small capacitor to one winding as shown in Fig. 11.5.1. This forms a parallel LC resonant circuit with the transformer primary, and therefore have high impedance at one particular frequency. The inductance of such transformers is often made adjustable and the whole assembly housed inside a metal screening can. The resonant frequency of the circuit can then be fine tuned after assembly. Once adjusted during manufacture, it is normally intended that further adjustment should not be needed. 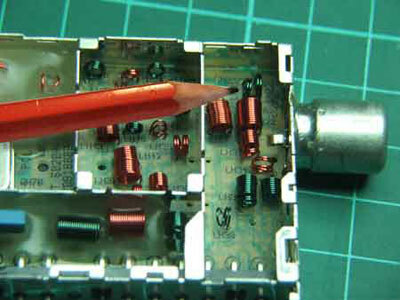 Fig 11.5.2 Surface Mount VHF Transformer. At Very High Frequencies of 30MHz to 300MHz the inductance needed in the windings of transformers is very small and can be achieved by just a few turns of wire. The surface mount transformer shown in Fig. 11.5.2 is wound on a ferrite core only a few millimetres wide. Fig 11.5.3 Inductors and Transformers in a UHF Tuner. At Ultra High Frequencies of 300MHz to 3GHz the losses in iron or ferrite cores are too great for these conventional cores to be used, also the amount of inductance needed can be provided by just a few turns of wire or less, as can be seen in the view of a UHF TV tuner (with the outer screening plate removed) in Fig. 11.5.3. Even small coils printed on the circuit board may be used as inductors and transformers. Because signals at UHF and above, predominately flow on the surface of the conductor it is common for inductors working at these frequencies to be plated with a very low resistivity material such as silver. It is essential, when working on circuits operating at VHF and above, that no component or wire is moved from its original position during servicing, as the tiny amounts of inductance and capacitance involved can be greatly influenced by nearby components. Transformers are electromagnetic devices and both produce, and are affected by electromagnetic fields. The problem of electromagnetic interference increases considerably as signal frequencies increase from audio frequencies upwards, becoming most troublesome at radio frequencies where electromagnetic fields radiate particularly well, this makes efficient magnetic screening essential. Electrostatic interference can also be a problem due to the capacitance between the transformer coils and any nearby components of wiring. Only a tiny amount of capacitance is needed at RF and higher frequencies for electrostatic fields to transfer voltages to or from the transformer. How a Screening Can Works. Fig 11.5.4 How a Screening Can Works. 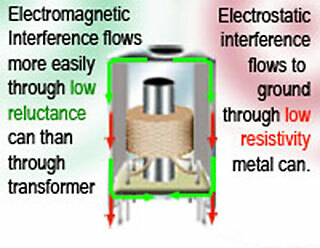 To reduce interference caused by electromagnetism, especially at high frequencies, transformers working at RF and above are normally completely surrounded by a metal screening can, which provides a preferred low magnetic reluctance path for any external magnetic fields to flow through, rather than flowing through the transformer itself. To reduce electrostatic effects, screening cans must also have a very low electrical resistivity and are connected to either the equipment ground potential, or to true earth. Any electrostatic fields are then effectively conducted away from the transformer. Metals normally used for conductors or for transformer cores possess one, but not both of these properties, therfore special metal alloys are used for screening cans that combine low resistivity and low reluctance. Two commonly used alloys go under the commercial names of "Mu-metal" and "Permalloy".